I had a pleasant surprise today, when Dulce Secrets released some new skins. Not just any skins, but new, alternatively toned skins. That is the great thing about Halloween, I can stock up all month on all the oddly coloured skins, and it normally lasts me a good while. The skins were a bonus, unexpected, but the real reason for me blogging today was this Necklace from Lost Junction, which is currently at Romp. I can’t say I had ever been to the event, because that is not my scene in sl. I went with a friend, had some silly fun, and saw this and fell in love. I adore spiders, in RL and SL. That is another great thing about this month, the hoards of spider related items, haha. There is a cute little event going on right now, called Oh So Skelegant Cart Sale. The theme is Elegant Skeletons, which I thought was rather fun. These nails are from Nail Me, who is participating in the cart sale. These are on sale, so it is worth it to stop on by and pick them up. There are 5 different colourations in this set. They have another nailset with a more halloween palette, also discounted, at the event. While you are at the booth, try your luck with their Trick or Treat Bag. Each booth has one, which is stuffed with a transferable goody. The bags are only L$10, and if you don’t like the item, you can pass it along to someone else! Now, I normally don’t do full reviews, but I felt that these skins deserved the time it takes to do so, so here it is. Bare, Midnight, Morose, Oracle, Betray and Deviant. I also hear tell that there is a way to get another makeup variation as a group gift, if you join the Dulce Secrets group. Craven, Indigo, Starlight, Bloodless, Malice and Flesh. The previously mentioned group gift also has each tone included. Each skin pack comes with Slink Appliers as well as an Omega Applier. I had too much fun with this jewelry set, I decided to show you some of my favorite combinations. The set comes with various metals, gems, spiders and webbing, which change by touch. 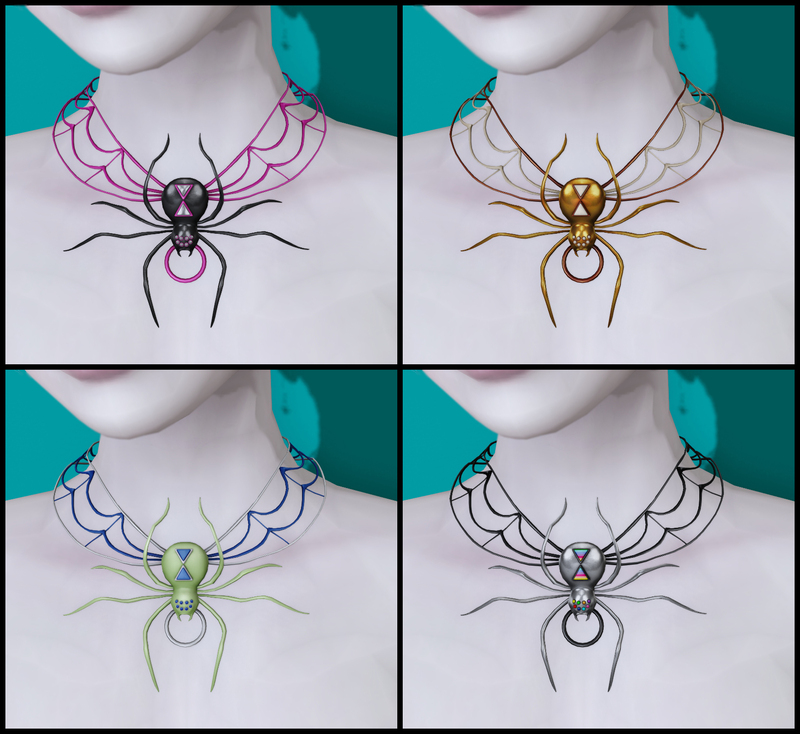 They also change independently, so for example, if you wanted spider on the necklace to be red, but the spiders on the earrings to be black, you can do that. There are so many combos, you can basically wear this with anything and make it work. If you would like to see all the included colours, please visit the Official Lost Junction Flickr HERE.